Let’s see who makes the top 30 but fails to make the top 20 with schools ranked 29-22. PS: One School you may never thought of is going to be seen here. Purdue may not be known for a winning history but the Boilermakers sure have given us some solid NFL talent. The top former Boilermaker is former Super Bowl MVP Quarterback Drew Brees of the New Orleans Saints. Brees is a future hall of fame Quarterback as the once Charger and now Saint Quarterback is an amazing nine time pro bowler, Super Bowl 44 Champion and MVP, a former First Team All Pro, two time offensive player of the year, former NFL comeback player of the year, seven time passing yard leader, and four time touchdown pass leader. Sure sounds like a hall of fame Quarterback to me. Redskins Ryan Kerrigan, Seahawks Cliff Avril, Patriots Rob Ninkovich, and Kawann Short of the Panthers get honorable mentions. Kerrigan is a two time pro bowler and has recorded 7.5 sacks in each of his first five NFL seasons. Cliff Avril was named to his first pro bowl in 2016 as the nine year veteran put together his best year as a pro recording 11.5 sacks. Arvill also has a Super Bowl 48 ring to brag about on his resume. Rob Ninkovich also wears a Super Bowl ring and has had four NFL Seasons where he had recorded at least eight sacks. Lastly Kawann Short has developed into a solid run stopper with back to back years of 55 total tackles. Florida is a school usually associated with winning which may make one scratch their head when seeing them so low on this list. However at this moment there aren’t that many great Gators playing but still are some very good ones. Redskin Tight End Jordan Reed is the top former Gator in the NFL right now. Reed is among the top Tight End’s in the NFL. He broke out in 2015 with a 952 yard, 11 touchdown in just 14 games played still crazy numbers for a Tight End. He followed that up with 686 yards and six touchdowns in just 12 games played. If Jordan Reed stays healthy in the future he’ll add plenty of Pro Bowls, and First Team all Pro Nod’s. Centers Maurkice and Mike Pouncey along with Reggie Nelson get honorable mentions. Maurkice Pouncey of the Steelers is a five time pro bowler, two time first time all pro, and and two time second team all pro in his fine career. Twin brother Mike Pouncey of the Dolphins is a three time pro bowl center helping the Dolphins reach the playoffs for the first time since 2008 in 2016. Raiders Safety Reggie Nelson is a two time pro bowler, former second team all pro Safety, and was tied for the NFL lead in interceptions in 2015. The Virginia Tech Hokies have some pretty solid alumnis playing in the NFL. 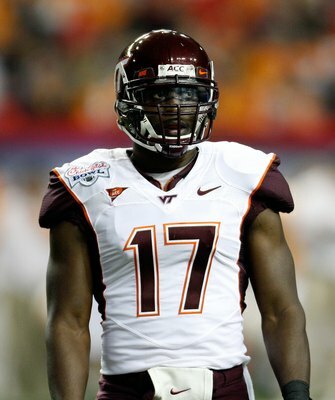 The top former Hokie is Seahawk Safety Kam Chancellor. Chancellor has been a huge part of the Seahawks legion of boom led defense. He is a four time pro bowler and was twice named to the second team all pro list. Chancellor also helped the Seahawks top ranked defense win Super Bowl 48. Texans Duane Brown, Bears Kyle Fuller, and Bills Tyrod Taylor deserve shout outs. Brown is a three time pro bowler at the Guard position and was named first team all pro in 2012. Kyler Fuller in his first two NFL seasons in Chicago has 119 total tackles, 19 passes defended and six picks from the Cornerback position. Lasty Bills Quarterback Tyrod Taylor was a 2015 Pro Bowler following his first season as an NFL Starter. As a backup to Joe Flacco in Baltimore Taylor earned a Super Bowl ring. Ole Miss is a school that has seen some great football over the years and if one thing is a trend in the NFL it’s that their players know how to win. 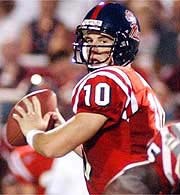 The top former Rebel in the NFL knows a thing or two about winning that being Giants Quarterback Eli Manning. Manning a future Hall Of Fame Quarterback is a Two Time Super Bowl MVP and Champion, four time Pro Bowler and since being named Starting Quarterback of the Giants in 2004 has never once missed a start. He has started 199 straight games for the Giants and has gone a great 108-91 in those games. Honorable Mentions go to Mike Wallace, Michael Oher, and Laremy Tunsil. Wallace a former Steeler and Dolphin turned Raven is a former Pro Bowl Wide Receiver and had his first 1,000 yard plus receiving season since 2011 in 2016 for the Ravens. Michael Oher helped the Ravens win Super Bowl 47 and has played seven solid NFL seasons. Laremy Tunsil had a great rookie year for the Dolphins in 2016. The Auburn Tigers don’t have that many former players in the NFL now a day but one of them is so good that he propels the Tigers into the top 25 of this list. 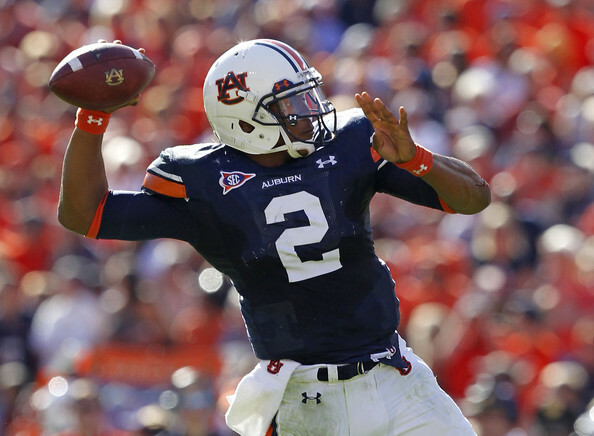 That man is the top former Auburn Tiger Cam Newton Quarterback for the Carolina Panthers. Newton is a three time pro bowler, former rookie of the year, and was named both NFL Offensive Player Of The Year, and NFL MVP in 2015 after an outstanding season where he led the Panthers to a 15 win season and an NFC Championship. Shout outs go out to Karlos Dansby of the Bengals and Sammie Coates of the Steelers. Dunlap though 35 years old is still playing at a high level. The former second team all pro Linebacker had 114 total tackles in 2016 and since 2007 has recorded at least 90 tackles each season proving how consent he is. Sammie Coates hasn’t made the biggest impact yet but has turned into a solid third receiver for Ben Roethlisberger in Pittsburgh. Tennessee is a winning program that has had some of its struggle the latest years but still has sent some great players to the NFL. 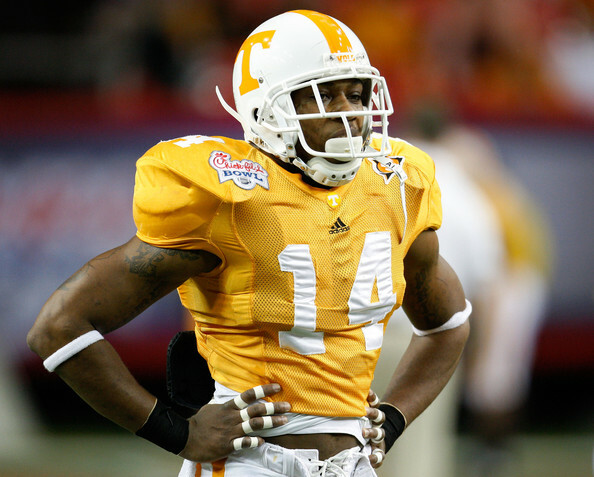 The top former Vol in the NFL right now is the great Chiefs Safety Eric Berry is a five time pro bowler, three time first team all pro Safety, and the 2015 NFL Comeback Player of the Year after he returned to remain one of the NFL’s top players despite battling Lymphoma. Honorable Mentions are given to Robert Ayers of the Bucs, Malik Johnson of the Jaguars, Jason Witten of the Cowboys, and Vikings Cordarrelle Patterson. Robert Ayers was a bit of a late bloomer breaking through in 2015 when he recorded 9.5 sacks for the Giants. After earning a big money contract to join the Buccaneers Ayers was able to record 6.5 sacks and forced a fumble for a much improved Bucs defense. Malik Jackson who was a huge part of a top ranked Denver defense in 2015 that won Super Bowl 50 was given a 90 million dollar contract by the Jaguars for 2016 and beyond. In his first year down South Jackson had a career high 6.5 sacks from the Nose Tackle Position. Jason Witten may be in Canton hall one day. The long time Cowboy Tight End is a 10 time pro bowler, two time first team all pro member, and a two team second team all pro. Cordarrelle Patterson is one of the top return men in the NFL earning two pro bowl nods, two first team all pro honors, and two second team all pro honors. Washington made the College Football playoffs as Pac 12 Championship in 2016 which means in the near future they may be higher on this list but currently still have one of the strongest groups of former players in the NFL. The top former Huskie is Chief Corner Marcus Peters. Peters in just two seasons is a two time pro bowler, first team all pro honor, second team all pro honor, former NFL defensive rookie of the year, and was the CO NFL interception leader in 2015. Though young Peters one day can see himself in Canton if he plays at this pace for years to come. Shaq Thompson, Jermaine Kearse, and Danny Shelton are all worthy of shout outs. Thompson is a solid Linebacker who is among the hardest hitting players in the league. Kearse has helped the Seahawks to a Super Bowl title, and NFC Championship and has made two of the most amazing catches in Seahawks history in the 2014 NFC Championship game, and in Super Bowl 49. Shelton has been a great run stopper for the Browns as he combined on 59 tackles in 2016. Here’s the surpise: Kansas is obviously all about Basketball and is among College Football’s worst power five teams however they actually have given the NFL some of it’s brightest defensive stars. For that reason they are all the way in the top 25. The Top former Jayhawk in the NFL is one of the two Bronco lockdown cornerbacks Chris Harris JR. Harris a Super Bowl 50 champion is a three time pro bowler, first team all pro Cornerback, and a second time all Pro Cornerback as he is among the top corners in the sport. Shoutouts go out to Aqib Talib and Bradley McDougald. Talib is that other Bronco lockdown corner. Talib has had an outstanding career as the Super Bowl 50 champ is a four time pro bowler, first team all pro Cornerback, and second team all pro cornerback. Bradley McDougald had 91 tackles for the Bucs at Safety in 2016. Posted in Auburn Tigers, Florida Gators, Kansas Jayhawks, NCAAF, NFL, Ole Miss Rebels, Purdue Boilermakers, Tennessee Volunteers, Virginia Tech Hokies, Washington Huskies and tagged NCAAF, NFL, Power Fives.